On March 11, 2011, a 9.0 magnitude earthquake rocked the Pacific Ocean off the coast of Japan. After the shaking subsided, harbors and shorelines were slammed by tsunami waves up to 133 feet high. Finally, the quake, tidal waves, and aftershocks caused major damage to the nuclear power plants in Fukushima, which spewed radioactive material into the surrounding environment. 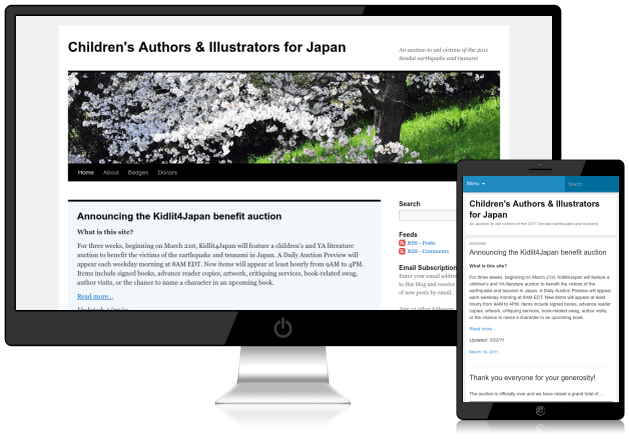 Groton Pixel’s head designer, Greg R. Fishbone, sprang into action with a website that auctioned goods and services from over a hundred authors, illustrators, agents, editors, and publishers. As a result, over $10,000 was raised for charities to help children in the affected area of Japan. This example shows how a website can bring a community together, how timely development can put content out at the peak of its importance, and how large amounts of content can be organized and released effectively. As a result, a real difference can be made, even half a world away.